It’s not often that we feel such a total attachment to a product launched by one of our clients. But I guess that when you’ve been involved in its naming as well as its unveiling, that sort of happens. So it was that we had a rather proud moment as over 150 people – including 60 journalists and TV crews – came to witness the unveiling of the first brand new Virgin Azuma. 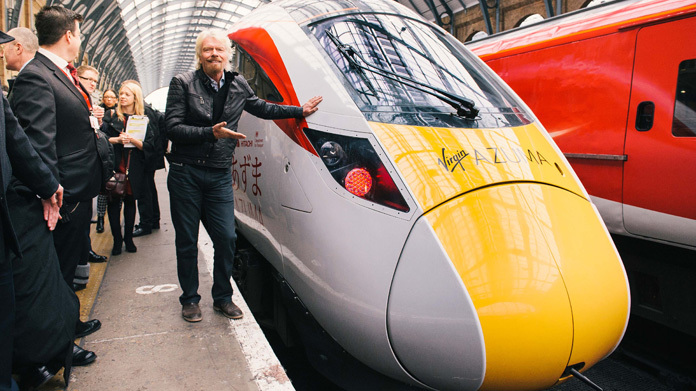 We actually worked on the naming of the trains – with a crack team from Virgin and Hope&Glory coming up with its Azuma moniker. That followed several workshops and extensive consumer testing – all run by the team. And then we got to unveil it to an expectant crowd. With meticulous preparation from a combined H&G and Virgin Trains team – it’s not easy to move unscheduled trains, takeover platforms for hours at a time and accommodate 60 journalists and crews at rush hour in London – it all went swimmingly. The BBC, ITV, C5 News, Reuters and around ten other broadcasters jostled for position, the main transport titles and national corries got their stories and witnessed Virgin Trains East Coast MD David Horne, Stagecoach founder Brian Souter and Sir Richard Branson welcoming the new trains. Capable of speeds up to 140 mph, liveried in Virgin hues and cutting the London to Edinburgh journey to four hours, the fleet of 65 Azumas really is going to make a difference. Coverage duly followed with pieces across BBC News (online as well as on assorted news bulletins), ITV (alongside national and regional news) and a host of others. The Nationals delivered a pretty clean sweep with The Times, Daily Telegraph, The Guardian, Daily Express, Daily Mirror, METRO, Evening Standard, Scotsman, Herald and hundreds more. A cracking first step in the Azuma’s media journey. And it’s off to a flying start!